We had such a good response to our Chocolate Bread that we decided to make some Nutella swirl buns to go along with it. The no-knead chocolate dough is not overly sweet, and it balances the Nutella and sugar coating quite well. We made them in individual molds, but you can also bake them free form in a 9 x 13 pan if you don’t have them. You can also try our Crockpot Nutella Swirl Bread (another Bread in 5 favorite!) or our straight up Nutella Swirl Bread (otherwise known as our Babka cheat) if you are in the mood for Chocolate and Hazelnut flavored treats. Butter ten 3 x 2-inch soufflé molds, ramekins, or other straight-sided molds (note: you can use regular muffins tins, but you will need to cut the buns smaller; into more pieces. You can also bake them free form in a 9 x 13 pan like traditional cinnamon rolls). Line the bottom of each mold with parchment paper, and then generously coat with granulated sugar, tapping out any excess. Place the molds on a baking sheet. Using a rolling pin, the dough out to an 1/8-inch-thick rectangle, and then spread the Nutella over the dough (you can use more than 1/2 cup, but I found that less is more here, both for taste and ease of cutting the dough into slices). If your dough is really soft and hard to work with, you can place it (filled and rolled) on a parchment-lined baking sheet and chill for 20-30 minutes before slicing. Use a kitchen scissors or a sharp knife to cut the dough into 10 equal pieces. Transfer the pieces to the prepared molds and place them cut side up. Cover the pans loosely with plastic wrap and let the dough rise until doubled, 1 to 1 1/2 hours. Adjust the oven rack to the middle lower position. Preheat the oven to 350F. Remove the plastic and bake 18 to 26 minutes, rotating the pan halfway through, until the rolls are set (You can test for doneness by tapping the top, if it feels firm in the center, then it is done). Transfer the pan to a wire rack and let the rolls cool for a few minutes. Use a kitchen towel or oven mitts to pick up each soufflé mold, then run a knife carefully around the edges of the pan, and flip the roll onto a wire rack. Carefully put the roll right side up, and repeat with the remaining rolls. Let cool for a few minutes, then toss each roll into sugar and cover. Christmas is just around the corner, and this year my sister-in-law volunteered to have the meal at her house, so this means I have some free time leading up the day, in which previous years I have not. (I am on pie duty, which I will take any day over making the meal) Since there will be family in from out of town and friends in and out of my house, I like to make sure there is something to eat each day for breakfast that everyone will enjoy. These Pumpkin Sticky Nut Rolls fit the bill perfectly, and the fact that I can assemble them the night before and let them rise in the fridge overnight is a huge bonus. It’s that time of year again: pumpkin in everything! I have to admit I don’t mind the pumpkin-y goodness showing up all over the interwebs; there is something very comforting (once the cold weather hits) about all the cinnamon spice in the air. We decided to update our pumpkin pie brioche recipe just a little, and as we are big fans of doughnuts over here, pumpkin doughnuts, of course, had to happen. If you are not yet in the mood for pumpkin, you can find our regular brioche doughnuts here. And, if you need a gluten-free treat, we have Apple Cider Gluten Free doughnuts here. Also! Don’t forget you can pre-order our new cookbook, Holiday and Celebration Breads in Five Minutes a Day. You can read all about the book here. The book comes out November 6th, and you can preorder here. Last week I posted a picture of this cinnamon braid (made with our no-knead brioche dough) on Instagram, and had several requests for a recipe. So here it is! It’s basically a cinnamon roll in a prettier package, but it’s fun to make, and would be perfect for a Mother’s Day brunch or just because. And, as it is National Poetry Month, here is a lovely one involving a kitchen, a ritual, and eating together. We’ve had a lovely Autumn here in Minnesota, with warm weather lasting far into October. However, November has brought about a winter chill, and with it the desire to head to the kitchen and bake with cinnamon and pumpkin. Often I turn to cinnamon rolls or caramel rolls, but I decided this time around to make Monkey Bread. 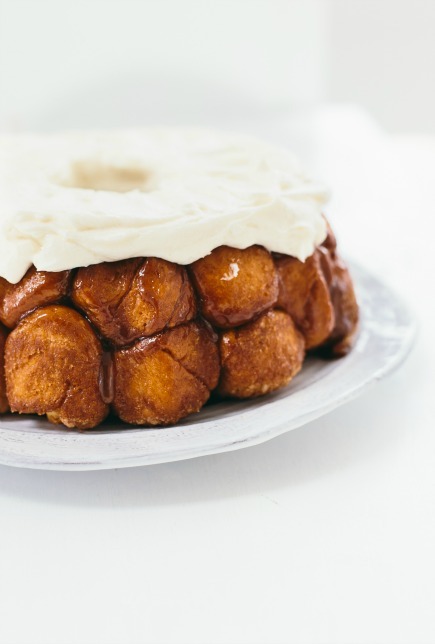 Monkey Bread is easy to make; it’s basically a pull-apart cinnamon roll baked in a Bundt or loaf pan. Zoe’s posted a standard recipe before, but today I’m doing one made with pumpkin spices, cinnamon, ginger, nutmeg, and cloves, and topped with a cream cheese icing. It’s the perfect way to celebrate the coming cold.